The Royal Dutch Mint have announced the launch of the popular Dutch gold Ducats. Both the one and two Ducat sizes with the year “2014” will be available from October. For the first time, the Royal Dutch Mint have added that the final mintage will be determined by the pre-ordering or reservations received by interested collectors before the 15th August, thereafter, that will be the number of each one and two ducat pieces produced. However, the Royal Dutch Mint have also added that a maximum mintage for each coin has been set which will not be exceeded. Dutch Ducat coins have a very long history, which spans more than four centuries with the striking of both silver and gold ducat coins in 1586 during the Dutch Republic. The coins were sought after and quickly gained a reputation of accuracy both in fineness and weights in an era when many coins were often under-weight or debased in some way. That tradition continued from the Dutch Republic into the modern era when the Kingdom of the Netherlands was proclaimed in 1815. The obverse design for both coins is inspired & reproduced from later strikes which were issued from 1817 and depict a standing knight facing to the right with a sword in right hand and holding a cluster of five arrows in his left hand. The legend in Latin reads “PARVAE CRESCUNT CONCORDIA RES” (In Harmony Small Things Grow). The two ducat strike includes a second circlet of dots towards the center. 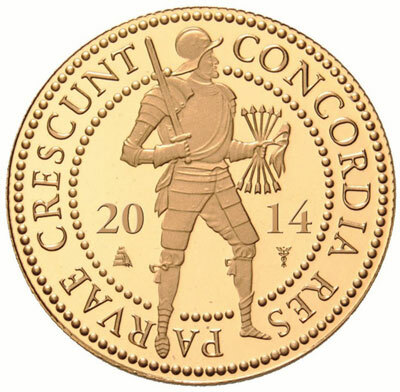 The year of issue “2014” is portioned in two digits and appears on either side of the knight along with the two current Royal Dutch mintmarks on both one and two ducat coins. The reverse design for both versions is identical and includes a square shape surrounded with baroque vignettes on all sides along with the text “MO. AUR. REG. 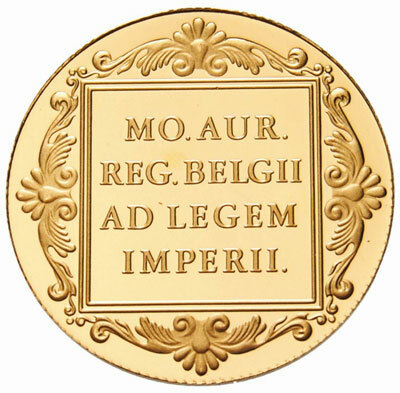 BELGII AD IMPERII” (Gold Money of the Kingdom of the Belgae According to Imperial Law). The inscription Refers to the Low Countries as Belgica Foederata or the “Federated Netherlands” and Belgica Regia, or the “Royal Netherlands”. The coins are scheduled for dispatch during the month of October 2014. For more information on these and other coins available from the Royal Dutch Mint, please visit their website at: http://www.knm.nl/Nederlandse-munten/nl/page/192/ Information available in Dutch – orders dispatched to European destinations only.